Don't fear taking on giant corporations as clients and business partners. Everyone benefits when Goliath hires David. Does size matter? It's a cheeky question, but also a valid one. As a small company, can you take on a large corporate client and serve them just as well as--if not better than--a big vendor can? Michael Fallone can offer a resounding "yes" to that question. After all, he and his co-founder, Doug Bartow, 39, and just four employees developed the design and creative foundation and executed many of the elements for the Harry Potter & the Deathly Hollows U.S. marketing campaign. A self-promotional mini-poster got Fallone's creative agency, id29, in the proverbial door at Harry Potter publisher Scholastic. Serendipitously, Scholastic's creative director plucked the poster from the mailroom where it was wallowing, as it was addressed to someone who no longer worked there. Fallone and Bartow were invited to submit a proposal for the Harry Potter project. 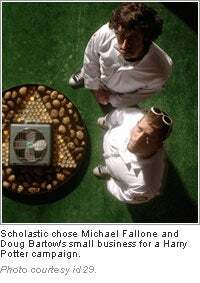 "We were up against some stiff competition, and Scholastic ended up choosing us based on our ideas and the creative we designed for them," says Fallone, 40, who expects $1 million in 2007 sales for his Troy, New York, firm. Gloria Irwin already had some big-business connections from her career in the hospitality industry when she started her two businesses in 2002. Her one-person promotional marketing firm, GIA Marketing, counts Harrah's Entertainment, Boyd Gaming and Isle of Capri Casinos as clients. In 2005, Irwin's research and tenacity paid off when she attracted her first memorabilia-products client in the gaming industry: The World Series of Poker. Irwin had previously dealt with more straightforward promotional items for her clients, such as items to promote Mother's Day. But after meeting football great Gale Sayers through her casino promotional work and helping him create memorabilia items for signings and events, she was inspired to bring that same style of products to the gaming world. "There was really nothing there [for memorabilia products] except for this little thing called The World Series of Poker," says Irwin, 36, who also does software consulting for the gaming industry from her home in Schererville, Indiana. "Over the course of two weeks, I did not sleep, my mind [was] racing about what products we could put together." Irwin put up money for samples and secured a meeting, and the company loved the items--coins, scarves, commemorative plaques and more. "It was definitely a matter of good products, right timing and being able to get myself in the door," says Irwin, who expects more than $500,000 in sales between both of her companies in 2007. Irwin juggles a mind-boggling amount of tasks between her two successful businesses. Her software business is actually her first love, so she uses subcontractors for GIA Marketing. "I worry about just putting anyone out there," says Irwin. "Oftentimes, before I'll just hire someone, I try to take it on myself until it impacts my obligation to the software companies I work with. I definitely have to trust the folks [I hire.]" Jennifer Hardaway is just beginning to feel the pressure of working with a big client. A buyer from Borders Books & Music happened upon her site, KLEAN Bath & Body, after reading about it on a blog, and requested product samples. Hardaway received her first purchase order in mid-September, and has hired a fulfillment company that--here's that serendipity again--just happened to e-mail her right after the buyer from Borders did. "I'm delivering the products to [the fulfillment company,] and they're blending, filling, labeling and shipping," says Hardaway, 39, who creates spa-style products in her North Hollywood, California, home and mainly sells through her website. "[I did hire a] friend to help me with the Sugar Body Polish. We got together one Sunday and made 21 five-gallon pails of scrub. Then I drove it down to the packaging company in a rented U-Haul." Hardaway doesn't yet know whether she'll have to keep up this pace. "I will see where this goes as far as Borders," says Hardaway, who expects $100,000 in sales this year. "But I am always growing my business and maybe eventually, I will approach more large companies, now that I have this experience under my belt." As business has increased, Michelle Kalbearer, 36, and her brother Jeff Cresswell, 33, also have had to make sure they're keeping up with demand. Their company, Klean Kanteen, sells reusable, eco-friendly water bottles to REI and L.L. Bean. The bottles are manufactured in two Chinese facilities, which someone from the company visits three to four times each year. "[Selling to large companies] has actually been good for us, as it keeps us on top of our inventory and improves our image," says Kalbearer, who expects the Chico, California-based company to bring in $2.5 million in sales this year, up from $750,000 in 2006. "This year has been difficult. As sales have grown exponentially, it's been hard to predict what monthly sales will be and order accordingly," she adds. "Some of our larger accounts have given us forecasts that have helped in our ordering process." The entrepreneurs we spoke with tend to agree that working with large corporate clients is peachy--for the most part. But they do sometimes face "too many cooks in the kitchen" syndrome. "It [can] make life difficult when there are too many decision makers and they can't agree on certain concepts," says Irwin. "Oftentimes, we find that we're mediating between departments." But the lack of that bureaucracy at your own company can be a selling point. "[The client] can interface with the principals of the agency, as opposed to an account executive who's been here for six months," says Fallone. "That can be pretty compelling for some clients and be a reason to choose a smaller agency." When seeking out large clients, you need to display confidence in your small business' strengths, he adds. "If you're a good businessperson, there's no reason to not believe you can compete extremely well against larger competition. Have the confidence to not apologize for your size, but to make sure that any potential client or business partner understands what you can bring to the table." And make sure you can meet those expectations, even if it means seeking assistance. "Get help wherever you can," advises Hardaway. "Don't be greedy. Pay people to do things and don't do it all yourself." Finally, don't neglect the little guys like yourself. Beyond the "don't keep all your eggs in one basket" credo, serving smaller clients offers a variety that'll keep you inspired. id29 serves local and regional clients, as well as national accounts like Scholastic, MapInfo and The Case Foundation. Klean Kanteens are sold in mom-and-pop, green-friendly shops in Chico and other California cities, as well as REI. As for Irwin, one of her latest orders speaks for itself: "One of my reps is working on a 250-piece pom-pom order for our local middle school."